Do You Have the Bandwidth for Your Smart Devices? Now that we’ve given you some tips on how to secure the IoT smart devices that you may give or receive during the holiday season, let’s make sure you have the Internet bandwidth you need to keep them operating at their best. Do you have enough bandwidth for everyone? 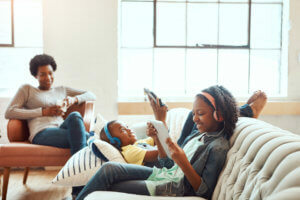 Consider a family of four, each with a smartphone, 2 with tablets, 1 with a Kindle, and let’s say that they have either a security system or an Amazon Echo type product. That’s 8 devices, and even if they are just sitting around idle, but powered on and connected to home wi-fi, they are using 8 Mbps of your total bandwidth right off the top. Add to that, 2 people streaming movies simultaneously, someone video chatting while gaming, and one person working at a computer and streaming music while they do. You’re just under 25 Mbps, and if a text or email is sent or received, or one of those idle devices decides to update, you’re above 25 Mbps. You can calculate the speed you need with some simple multiplication. Consider the highest usage time in your house: that’s probably in the evening when you might be checking email or catching up on social media while watching TV, the kids might be doing homework or playing video games, etc. First, count up those idle devices. Then make a list of what each member of your family is doing that requires the Internet. 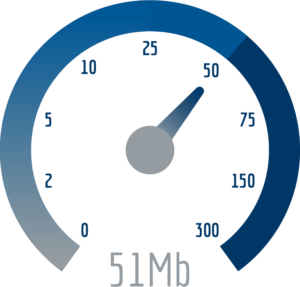 You can then use the chart above to estimate the amount of bandwidth you are all collectively using. OR……You can check out our free bandwidth calculators. We have one for residential use and one for business use.